﻿ The Sprite Cemetery/The People's Sprites: Sonic the Hedgehog Annex. 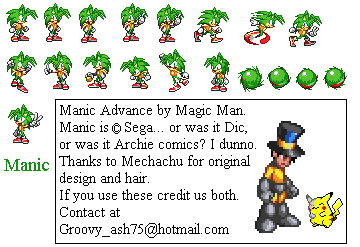 Manic the Hedgehog Advance by Mechachu and Magic Man/Groovy Ash. Made by Mechachu and Magic Man/Groovy Ash. Sonic Advanced. SEGA. Gameboy Advance.